The quiche is a french tasty pie filled with a mixture of eggs, milk or cream and garnished in so many ways with meat (bacon, ham, chicken…) or seafood and/or cheese and/or vegetables (spinach, leek…). 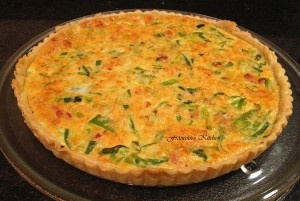 Quiche is great and works for any meal like breakfast, brunch, lunch or dinner. It is perfect also for a picnic or to put in a lunch box. In this Leek and Bacon Quiche, leek gives a nice mild onion flavor to the quiche and at home we prefer to use a homemade thin crust like my pâte brisée recipe. Unroll the pie crust and precisely fit it in a pie pan. Poke the dough all over with a fork. Then put the pie in the fridge. Cut the root of the leek, remove any ragged, coarse outer leaves and discard. Slice lengthwise but not completely to hold the leek together. Rinse under running cold water while separating leaves until the leaves are completely clean. Cut the leek finely. You may rinse again in water. Put the bacon in a frying pan over medium heat. When the bacon is lightly brown, put aside on a paper towel to remove all the fat. In the frying pan, put the onion, leek, salt and pepper. Let it cook until tender. Add some water if they tend to burn. Take out the pie crust from the fridge. Sprinkle some Parmesan. Add evenly the bacon, then the onions with leeks. Put some Swiss cheese. In a bowl, whisk the eggs with the heavy cream, salt, pepper, and nutmeg. Pour into the pie. Bake for about 25-30 min. Once the pie is baked, remove from the oven and enjoy with a salad.